As mentioned, each child is different. They need diverse compliments and discipline. This means that your approach to each child must also be different. If they get into a dispute, the method you use to calm one of your children may be completely different for the other. From my personal experience growing up (I’m a middle child with 2 sisters so feel free to share your sympathies!) all it took was a certain tone of voice from my mother to get me to stop quarreling with my sisters. In contrast, my sisters needed stern lectures and threats of having privileges removed to behave (obviously I’m the favorite child. I’m kidding! My parents insist they love us equally. Let’s go with that!) So, what are the major reasons why siblings argue (myself included) with each other? 1. Comparing your children. This may seem obvious, but parents can find themselves doing this without realizing it. For example, if one child is doing better in school than the other, the tendency is to compare them. You may put the academic child on a pedestal for the other child to imitate. Avoid doing this. You should not compare your child to their brother or sister or to any other child. This can result in resentment towards the sibling or even you as the parent. 2. Lack of privacy. I know what you’re thinking, why do kids need privacy? Think about it, did you like having to share everything with your siblings? Hand me downs are usual, but children still want to feel like individuals and not carbon copies of their siblings. So yes, children may argue because they need their personal space. 3. Too much responsibility on the older child. It’s good to have older ones help with certain tasks around the home. Yet, they should not be responsible for raising their younger siblings. Arguments may result when the older child feels pressured to always watch or play with the younger ones. 4. Not understanding your children’s emotions. Children are entitled to their emotions. This can be a source of distress for their siblings and parents alike. No matter the age of your child, if they have a complaint against their sister or brother, you should listen to their concerns. Treat their feeling as valid. Depending on their age, they may not be able to properly communicate their issues. It takes patience on the part of the sibling and parent. There are many other reasons for disagreements between siblings. Depending on your children and environment, the reasons, frequency and intensity of arguments may vary. In a previous article, I discussed other reasons for arguments. You can read more about them: How Teenagers And Parents Can Stop Arguing and Why Children Argue With Parents – Effective Ways To Stop. Don’t feel discouraged! Not only can you prevent your children from bickering, but you can learn to intervene helpfully which will prevent future arguments from occurring. Before this post has concluded, I will leave you with tools to keep you motivated as you work on upbuilding your family. To begin, take a look at the following Learn how to tackle the most common time management mistakes. It includes a FREE 45 minute training from Brian Tracy, a motivational consultant and author. Check it out below! Parents, You Can Prevent Your Children from Arguing! 5. Give each child individual consideration. Children who feel adored and acknowledged for their identity will be less inclined to battle with each other, verbally or physically. Sibling rivalry is reduced when parents focus on each child. 6. Know your children’s “triggers.” If you know that squabbles occur when your children are bored, try to keep them busy. During those quiet, tense moments before the storm, quickly get them involved before they get exhausted and a clash ensues. Along with boredom, feelings of tiredness and hunger can also cause arguments. 7. Educate your children on basic critical thinking abilities and compromise. You can show your children ways to negotiate with each other without having to involve you. They can learn to take turns with chores or choosing which game to play first. Teach them ways that they can all win if they are fair and patient. When they come to you with a specific issue, you can use that as a model for them to follow. Let them discuss their problem one at a time. Acknowledge their point of view, sympathize with them and then show them step by step how to resolve the conflict. Let them know that they can do the same with future problems. It’s never too soon to teach they how to cultivate empathy for others. 8. “R.E.S.P.E.C.T finds out what it means to me.” Each child needs to learn how to respect each other and both parents. Respect should be extended to each other’s personal space, time and possessions. Enforce the concept of teamwork to them. You want to remind them that they are allies not enemies. They should help one another at home, school and in public. This will decrease the rate of disagreements. It is a lot of work initially, but it is worth it in the end. The problem many parents face preventing and stopping arguments is the lack of energy and motivation at times. If that’s the roadblock you face, there is a FREE inspirational eBook by Brian Tracy called Book of Motivational Quotes To Live By. You will also read quotes from successful people who have effectively balanced their home and work lives. I have watched the motivational videos by Brian Tracy and I am certain you will benefit from the action plans included in this book. As a parent, when you develop yourselves personally, you can set an excellent example for your children. Parents, you can stop your children from fighting based on the example you set. When your children see you treat everyone including them with respect, it is easier for them to be respectful to others. If they see you arguing all the time, at restaurants, with your neighbors, in traffic, then they will consider arguing normal communication. Another error I have seen is parents treating their children like adults. You must remember that they are kids. They will grow and mature, but it takes time and many errors on their part. When they make a mistake, do not expect them to never make that same mistake again. It may take several tries before they get it right. Remember, you are your children hero. They will shadow you and take on your best and worst qualities. Watch what you say and do. Also, never allow your frustration at your children’s arguing to cause you to do something you regret. When you are upset, find something to calm you down or motivate you to respond in the right way such as Brian Tracy’s book. You never want to physically punish your children. If you punish your children in anger, they are more likely to be angry and abusive as well. Use positive disciplinary strategies instead. If you want me to write a post on healthy disciplinary tactics, let me know in the comments below! Below is a video by TED Talks featuring Jeffrey Kluger on the topic,” The Sibling Bond.” He speaks about engaging or re-engaging your brothers and sisters. Siblings are at the top of the list of most important bonds that you can have. It isn’t always easy to develop and strengthen your relationship with them but when you do, it is invigorating. After you apply these tips, you will notice the difference in the atmosphere in your home. You want to have a peaceful atmosphere where everyone feels appreciated. Applying the advice found in this post and in this book can contribute to your success. 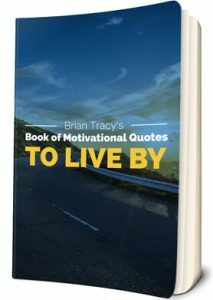 Motivate yourself with a collection of my thoughts on self-confidence, goal achievement, happiness, and more from BrianTracy.com. Get the Book of Motivational Quotes to Live By FREE E-Book. Thank you for reading! I hope you enjoyed the tips found here. Please comment below if you have any questions or feel free to leave your firsthand experiences on what has helped you prevent or stop siblings from arguing. I am down to one left in the house. I am glad I don’t have to keep them from arguing anymore… but I miss them all. Thanks for the reminder of the good old days when everyone was together. My strategy for keeping them from arguing was letting them work it out themselves. I am glad the 3 that are grown have become responsible adults and they are all friends as well as siblings. That’s great Heather. Siblings must learn how to work things out for themselves. In the real world, they will meet people who they disagree with and need to learn as early as possible how to prevent and solve differences. On the days I did not get along with my siblings, I still was happy to have all of them in my life. I am happy you enjoyed and benefitted from the post. When I read it I had to think and reflect a lot on the relationship with my brother. And in some moments it was painful. Especially during the Ted speech of Jeffrey. I think siblings are one of the most important relationships you can have in your entire life. When your parents die, your siblings will be the only memory of them. Fights and struggles maybe occur but there will never be a point that makes forgiving impossible. I think as a parent it is not always easy to keep equality. But the most important thing in my eyes is to teach siblings to trust and love each other no matter what is going to happen. Because the worst thing you can feel is the pain of a lost relationship with your brother or sister. Thank you for the beautiful article. Do you have maybe a tip on how to stop comparing yourself with your siblings? since all of us learn at our own pace. common with my sisters which drew us together. include yourself in your sibling’s interests. Thanks for this! I didn’t grow up with very good sibling relationships (we’re actually close now, but there was a lot of tension and clashing as kids and teens), and I’m trying to be more intentional about how I model good relationships to my kids in the future. These are helpful suggestions! Hi Anna, I think most of us feel the way you did. You may not have had the closest relationships with your siblings growing up but want better for your children. Once we recognize what caused the divisions growing up, we can work on solving the underlying tension. This will benefit you and your children today. I am happy to hear that you and your siblings now have a great relationship. Wishing you and your family all the best and please feel free to share any tips you may have. Hi Rachel, I am glad to hear you found this post informative! Yes, personal space is important. Growing up as a middle child, I had to fight for moments to myself 🙂 It is good that you recognize what each of your children need and provide them with it. Whether it’s time alone or individual time with their parents, children need space the same way adults do. Ahhh the perfect topic for 99% of us parents, as a mother of three some days I thought I would lose my mind, I just didn’t know what to do I would go as far as spewing threats of bodily harm still to no avail I asked my mom what she thought would work with stopping all the arguments over socks and hair ornaments etc. and she exclaimed “child in my day growing up we were obedient and listened to our parents and your dad and I had very little problems with all of you, this is a totally different generation” oh well that didn’t help, in fact I felt worse after hearing that but it is what it is, thanks a lot Max very informative, I now know what I wish I had known long years ago. I agree, it is a different generation with different problems. However, at the end of the day we all want to be treat fairly and with respect. Once each child understands that you love them all unconditionally and want to help them, they will realize the importance and benefits of applying the guidelines found here. Thank you for reading! This article is very informative for parents, especially for me with two boys being three years apart and with different personalities it can get CRAZY sometimes. So thank you for the tips and I will share this article with my boys so that we can all be on the same page. And I am sure other parents will be thankful for the tips as well. Hi Daina. Yes, I can only imagine having two energetic boys with different personalities around the house. I am happy to hear you have benefitted from the tips here and please feel free to share with us the results of the advice after sharing with your sons.